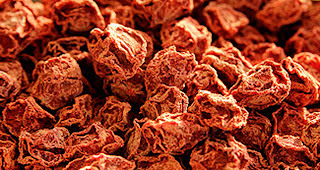 Li Hing Mui... "The Traveling Plum"
You can purchase this product online at this site. Originally from China, the name "li hing mui" means "traveling plum". My guess is that it is called "traveling" because this salty dried plum is preserved, making it portable and easy to use in many recipes. It has a strong, distinctive flavor, and is often said to be an acquired taste, as it has a combination of sweet, sour, salty, tart, and even tangy taste. 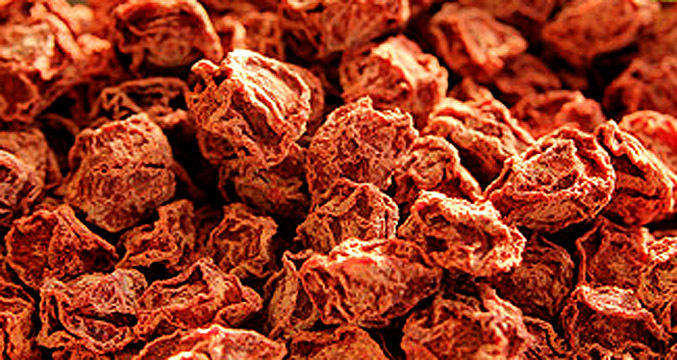 It was made popular in Hawaii by Yee Sheong, who in early 1900, had began importing Li hing mui and various other preserved fruits from China to Hawaii. The Li Hing Mui craze was started by Yee and flourished with the company he founded, Yick Lung. 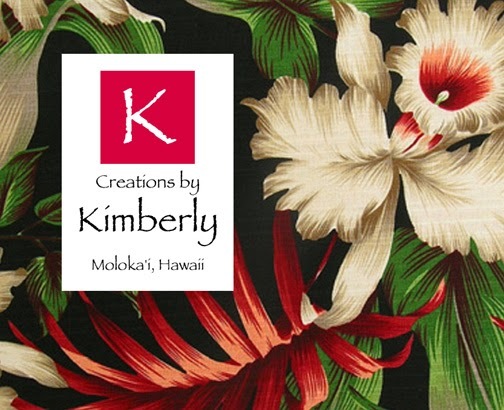 Today this brand is no longer available, but other brands can be found in Hawaiian and Asian markets, and online. and online at this site. 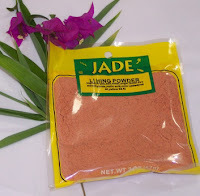 Li hing mui powder can be used as a flavoring usually sprinkled on candy and other fruits notably pineapples and apples. Recently, people have also been putting li hing powder into their alcoholic drinks—mainly tequila cocktails. Many bars in Hawaii also rim their glasses with li hing powder in addition to putting it in the drink. There's a number of brands out there, but my favorite brand of li hing mui powder is the "Jade" brand. 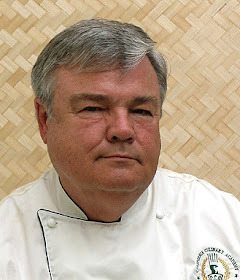 Checkout this website or more information about li hing mui, and a delicious recipe for "Li Hing Mui Vinaigrette". Place the boneless chicken thighs into a large mixing bowl. With your hands, mix in the rest of the ingredients all over the chicken. Place coated chicken on a foil wrapped baking sheet and bake in a 350 degree oven for 45 minutes to an hour. Serve garnished with cilantro over seasoned rice with vegetables on the side. Make the li hing mui macadamia butter by combining all of the ingredients in a small bowl, put aside. Put cleaned shrimp in a large bowl. Add all other ingredients. Toss well to coat shrimp. Place on a shallow baking sheet. Broil on high, 7 inches from heat, for about 6-7 minutes, turning once. Toss shrimp with butter sauce and sprinkle with extra macadamia nuts. Serve with rice pilaf, sliced lemons, and steamed show peas. Peel pineapple and cut into chunks and put in a bowl. Sprinkle li hing mui powder over pineapple. Stir well, adding li hing mui powder to taste. I like it when the pineapple is quite reddish colored. Serve immediately or refrigerate until ready to serve. Peel green mango with a vegetable peeler. Slice into thin strips and discard the seed. Set aside. Bring sugar, vinegar and salt to a boil. Continue boiling until sugar dissolves. Cool. Stir in li hing mui slices and pour over mango slices. Store in airtight container. Combine all ingredients except prunes or apricots. Bring to a boil then add prunes or apricots. Cook for about 3 minutes over low flame. Store in a sterilized jar and soak for two days before eating. 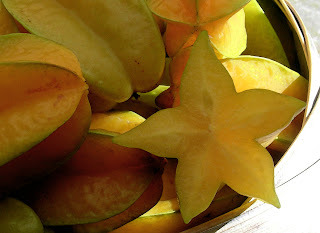 The starfruit, known by Hawaiians as "five fingers", comes from a tree that produces fruit twice a year here in Hawaii. I have a tree that I planted in my back yard about 8 years ago (photo to the right), and it is loaded with fruit this time of year (October through November). You see people selling starfruit at our farmers market on Saturday mornings here on Moloka'i, but many people don't seem to know what to do with them other than to just eat them out-of-hand. Chefs all over the islands have discovered this beautiful fruit and are using it as a garnish, or as an ingredient in their tropical cuisine. Starfruit, is the fruit of the species Averrhoa carambola, a tree native to the Philippines, Indonesia, Malaysia, India, Bangladesh and Sri Lanka. The fruit is popular throughout Southeast Asia, the South Pacific and parts of East Asia. Starfruit has distinctive ridges running down its sides; in cross-section, it resembles a star, hence its name. The entire fruit is edible, including the slightly waxy skin. The flesh is crunchy, firm, and extremely juicy. It does not contain fibers and has a texture similar in consistency to that of grapes. When ripened, starfruit are sweet without being overwhelming as they rarely have more than 4% sugar content. The taste is difficult to compare, but it is sort of like a combination of apple, pear, and citrus family fruits all at once. Unripe starfruit are firmer and sour, and taste like green apples. 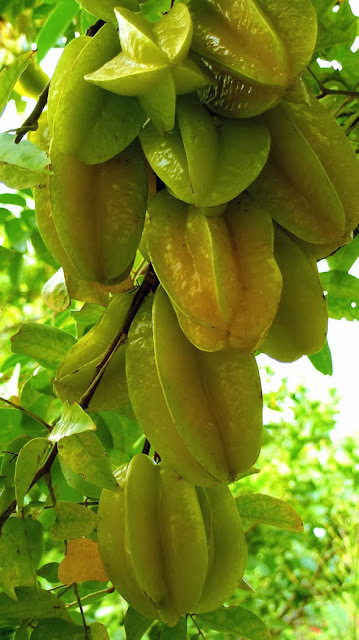 Starfruit are best consumed shortly after they ripen, when they are yellow with a light shade of green or just after all the traces of green has disappeared. They may also have brown ridges at the edges and feel firm. Fruits picked while still slightly green will turn yellow in storage at room temperature, but will not increase in sugar content. Overripe starfruit will be yellow with brown spots and can become blander in taste and soggier in consistency. Ripe starfruit may also be used in cooking. In Southeast Asia, they are usually stewed in cloves and sugar, sometimes with apples. In China, they are cooked with fish. In Australia, they may be cooked as a vegetable, pickled, or made into jams. In Jamaica they are sometimes dried. Unripe starfruit can be mixed with other chopped spices to make relishes in Australia. In the Philippines, unripe starfruit are eaten dipped in rock salt. In Thailand, they are cooked together with shrimp. The juice from starfruit is also used in iced drinks, particularly the juice of the sour varieties. In Hawaii they are used to make sherbet, while in the Philippines they can be used as seasoning. In India, the juice is bottled for drinking. Health Notes: Starfruit is rich in antioxidants, potassium, and vitamin C; and low in sugar, sodium, and acid. It is also a potent source of antioxidants. Starfruit is safe for most people to eat, but unfortunately, it contains oxalic acid, which can be harmful to individuals suffering from kidney failure, kidney stones, or those under kidney dialysis treatment. Consumption by those with kidney failure can produce hiccups, vomiting, nausea, and mental confusion. Fatal outcomes have been documented in some patients. Like the grapefruit, the consumption of starfruit or its juice in combination with certain medications can significantly increase their effective dosage within the body. Research into grapefruit juice has identified a number of common medications affected, including statins, which are commonly used to treat cardiovascular illness. Read more. Wash and wipe the starfruit dry. Remove the hard ridge on the fruit with a potato peeler. Remove the seeds. 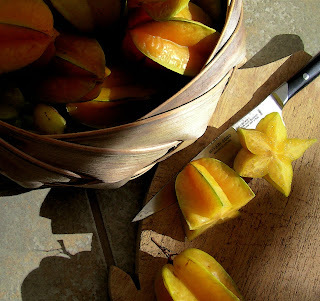 Cut starfruit into 1/4-inch thick star slices (count out 3 slices per person) set aside. Place the mango fruit in a food processor, or blender. Process or blend until it is smooth and pureed. Place mango puree in a pot with orange juice and sugar, and turn heat to high until juice begins to boil. Then turn down to low. Add sliced starfruit and allow to simmer for 10 or 12 minutes, or until fruit has softened. Remove pot from heat. Do a taste-test for sweetness, adding more sugar if needed (how sweet it is will depend on the ripeness of the fruit/juice you're using). If it happens to be too sweet for your taste, add a squeeze of fresh lime juice, or a little more orange juice. When you're happy with the taste, portion out 3 starfruit slices per bowl with enough sauce to surround the fruit (it should still be warm from the pot). Top each bowl with a sprinkling of pomegranate seeds or cherry halves. Then drizzle over some coconut milk and serve immediately. Makes 4 servings. Starfruit are usually harvested in October and November in Hawai'i, just in time to try this beautiful recipe during the Holidays. 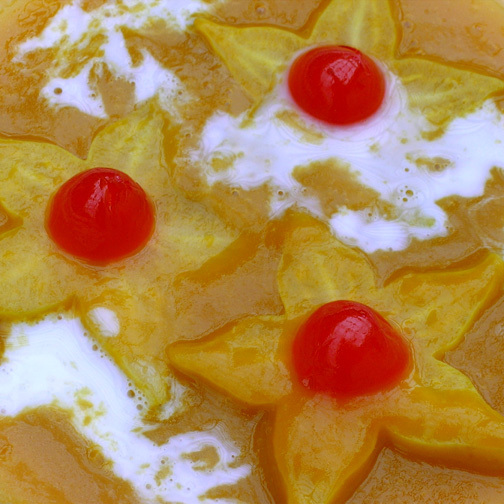 Traditionally this recipe used old fashioned Red Hots cinnamon candy and whole clove studded canned peaches, but starfruit are more festive than peaches, and more Hawaiian. These delicious candied starfruit sweet pickles are great as a garnish for a festive Holiday drink (1 part vodka or white rum, 2 parts juice from the jar, a squeeze of lime, and ice). Use them as part of a tropical dessert, perhaps served with other fruit like fresh pineapple and grapes, or serve on top of hot oatmeal on a cold morning, or simply given as a gift with a bow. Take a knife and remove the top and bottom of each starfruit. With a potato peeler, remove tough top ridge on each of the starfruit arms. Cut each starfruit into 1/4-inch stars. Remove as many seeds as you can, they are hard like apple seeds. Sterilize the jar and lid covered in boiling water for at least 5 minutes. Carefully remove the hot jar with a long handled wooden spoon, then pack the jar with cinnamon sticks, cloves and cut starfruit. Stir together food coloring, sugar, vinegar, water, and Red Hots cinnamon candies in a pot over medium heat until sugar and candies dissolve, stir often. Pour hot pickling mixture into starfruit filled jar, filling to within 1/4 inch of the top. Run a knife or a thin spatula around the insides of the jars after they have been filled to remove any air bubbles. Wipe the rim of the jar with a moist paper towel to remove any pickling syrup. Top with lid and screw on ring tightly. Carefully place filled jar back into boiling water for 15. Remove jar and let sit at room temperature until cooled. Refrigerate the jar if it does not seal. Let sit for three days before serving. Makes 1 quart. Note: Simply double or triple this recipe to make more than one quart. You can find fresh starfruit at our Saturday Farmer's Market here on Moloka'i. This recipe makes for a festive Holiday side dish, especially at Thanksgiving, served with roast turkey. Fresh starfruit is usually available in October and November here on Moloka'i. Make sure everyone gets a star with their cranberries when served. Cook the cranberries, sugar, orange juice, and ginger in a saucepan over low heat for 5 to 10 minutes, or until the skins pop open. Wash and wipe the starfruit dry. Remove the hard ridge on the fruit with a potato peeler, then cut into 3/8-inch star-shaped pieces. Remove the seeds, which are hard like apple seeds. Add the starfruit slices, zests, and juices and cook for about 15 more minutes. Remove from the heat and add the raisins and nuts. Let cool, and serve chilled. Makes 4 cups. Note: You can double this recipe to make about 3 quarts. I like to put them up in canning jars and give them to friends over the Thanksgiving holidays. There are many varieties of chutney, they may be either wet or dry, and can be made from almost any combination of vegetables, fruits, herbs and spices. Chutneys are usually grouped into sweet or hot forms; both forms usually contain spices, including chili, but differ by their main flavors. 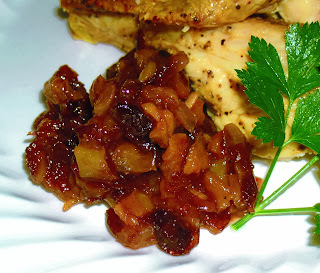 This recipe uses fruit that can be purchased here in Hawaii, and is usually served during the Thanksgiving holidays, however I find that it is a delicious condiment to have on hand all year to serve with roast chicken, venison, pork, or wild game. In a large non-reactive saucepan, combine all ingredients except the pecans, raisins, starfruit, orange zest and cranberries. Bring to a boil. Reduce heat to medium and cook for 5 minutes. Add the pecans, raisins, and star fruit, cook until soft but not disintegrated, 5-8 minutes, depending on the firmness of the starfruit. Then add the orange zest and cranberries, cook, stirring frequently, over low-medium heat until the mixture has the consistency of thick jam (at least another 30-35 minutes). At this point you should taste the chutney and adjust, if needed, to your taste. Let cool to room temperature, pack into jars with close-fitting caps, and refrigerate. This chutney will keep for three months or more in the refrigerator. Makes two quarts. This is a wonderful recipe served as a side dish with pork or chicken. It can also be served as a dessert by adding a little more brown sugar. With a vegetable peeler, take the tough fibrous rib that runs along each edge, as well as the brown tips off the points of the starfruit. Slice the starfruit into 1/4" slices. Poke out any seeds with a knife. Cut the papaya in half; discard the seeds, scoop out the flesh into a food processor or blender. Process or blend until smooth. In a small bowl, combine the orange juice and cornstarch. In a medium saucepan on high heat, add the orange juice mixture and brown sugar; stir until dissolved. When it begins to boil, turn it down to medium. Add the papaya puree and combine. Add the starfruit slices. Simmer for 10 minutes. Turn starfruit at least once during simmering stage. Remove from heat. If serving as a side dish, place starfruit on individual plates and spoon the sauce over them. Top with pomegranate seeds. Makes 4 servings. Pavlova is an Australian dessert with a meringue base, topped with fresh cream and any fruit you like. This beautiful version uses tropical fruit found here in Hawaii. To make meringue: Heat oven to 225˚F. Grease a cookie sheet, line with wax paper and grease paper. Place inverted 8-inch cake pan or plate in the middle and draw outline using skewer or toothpick. Beat egg whites in a large bowl with electric mixer until soft peaks form when beaters are lifted. Very gradually add sugar, beating until stiff, glossy peaks form. Beat in corn starch, lemon juice and vanilla until blended. Just before serving, beat cream, sugar and vanilla in a medium-size bowl until soft peaks form when beaters are lifted. Transfer meringue to serving plate: Fill with whipped cream. Toss fruit in a large bowl to mix: spoon over cream. Makes 6 servings. In a small saucepan combine grape juice, sugar, stick cinnamon, whole nutmegs, and orange peel. Cook over medium heat, stirring constantly, until sugar dissolves. Bring to boiling and reduce heat. Cover; simmer 5 minutes. Remove from heat. Cool 15 minutes. Remove cinnamon and nutmeg. Meanwhile, in a large bowl layer half of the strawberries, all of the nectarines, the grapes, the oranges, then the remaining strawberries, and lastly the starfruit; cover and chill. For transporting, place grape juice mixture in a covered plastic container. To serve, pour juice mixture over fruit layers. (If outside, place bowl on ice until needed.) Makes about 15 servings. Chop 4 of the starfruit, put in food processor and puree. Strain the pureed fruit in a fine strainer to get all of the juice out of the starfruit without the pulp. Use a spoon to push the fruit through the strainer. Whisk in the sugar, orange zest and vanilla extract. Cut the fresh lilikoi in half and with a spoon, scoop out the juice and seeds and add both to the mixture. Add the milk, whisk, then place the mixture in the refrigerator for 1 hour. Pour the mixture into your ice cream maker and churn until frozen, about 1/2 hour. Scoop out the sherbet into a plastic container and continue freezing about 3 hours, or until hard. To serve, place one or two scoops of sherbet into 4 dessert glasses or martini glasses and garnish with a slice of starfruit. Makes 4 servings. Before beginning any jam or jelly making session you should already have your jars, lids and canning tools sterilized and at the ready. Sterilize your jars by placing them into a pot of boiling water until completly submerged. Remove them from the boiling water and place them upside down on top of a dish towel. Also dip your funnel and ladle into the boiling water and place at the ready on your dish towel. Place the flat lids into a small pot and bring to a boil. Turn heat off and leave lids in hot water. Always prepare a few extra jars and lids then your recipe calls for. You don’t want to be caught with enough jam to fill an extra jar or so and not have a sterilized jar ready. Wash and remove any blemishes from the carambola fruit. Slice them and the remove all seeds before putting the fruit in the pot. Wash hull and slice strawberries. Sliced starfruit and strawberries. Add the sugar into the large pot with the fruit and place on the stove on a medium heat. Stir the fruit and sugar with a wooden spoon to get the fruit juices flowing. Add the lemon or lime juice and butter to the pot. The butter will help cut down on foam. Stir the sugar and fruit occasionally. Allow the sugar to melt completely on the medium heat. 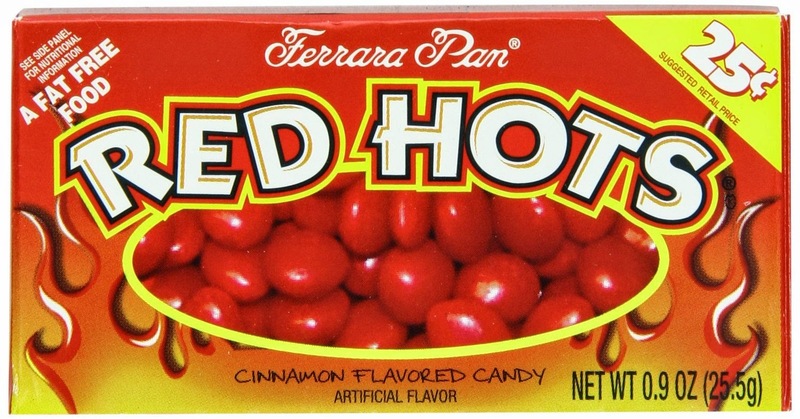 You don’t want the sugar crystals to burn from too high a heat at this point. Once the sugar has melted turn the heat up to medium high, carefully stirring occasionally and bring to a rolling boil. Add the liquid pectin and bring to a rolling boil once again. Cook fruit mixture for one full minute using a timer. Once the minute is up remove from the heat to your counter top. Once the mixture stops boiling and settles down skim the foam from the top with a large spoon. Using a ladle and a wide mouth funnel fill your jars leaving 1/4 inch of head space. Wipe the rims of the jars with a damp paper towel and put the flat lid on. Screw your lid bands on. Continue filling all your jars and process in a boil water bath for 10 minutes. Note: It's tricky getting starfruit jam to set up. 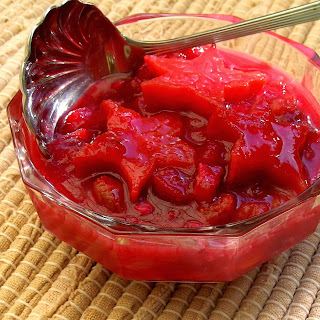 There is little if any natural pectin in the fruit, so it must be mixed with liquid pectin. This jam could remain runny for at least a week, maybe two, but should gradually thicken. Makes 6 1/2 pints of jam. With a vegetable peeler, take the tough fibrous rib that runs along each edge. cut the ends off the starfruit. Slice the starfruit into 1/4" slices. Poke out any seeds with a knife. Save two starfruit slices for garnish, then, in a blender, process starfruit, honey and ice until fairly smooth although some small fruit pieces will remain. Add rum and pulse to combine. Fill glasses, sprinkle with nutmeg and position starfruit slice on glass rim*. Makes 2 drinks. *Cutting a small wedge on one of a starfruit slice's inside angles, makes it easy to position the slice on the glass rim. "Love-Child" might be going overboard, but I have to admit that this is one of my favorite soups of all time. Part of it is that I happen to love potatoes, but when you combine potatoes with leeks, onion, garlic and cream, how can you go wrong. Normally this soup is blended until smooth, but I prefer my "rustic" version with small slices of potato that have the skins left on. The Germans and Portuguese would have liked it this way. They brought the potato to Hawaii many years ago. This is a simple, straightforward soup, and is a great first course when guests stop by unexpectedly, or to enjoy by yourself on a cold day. Melt butter in a large pot over medium heat, with olive oil. Add onions, leeks, garlic and salt. Cook, stirring, until onions are limp and just slightly brown for about 10 minutes. Add sliced potatoes and bay leaf to the pot with chicken broth to cover, stir. Continue cooking over medium low heat, stirring often for about 30 minutes or until potatoes are tender. Break up potatoes with a wooden spoon, but don't mash. Add half-and-half, and mace. Stir and taste for seasoning. Add salt and black pepper to taste. Remove bay leaf. Serve and garnish bowl with snipped fresh chives. Other garnishes might include, croutons, sour cream, crumbled bacon, grated cheddar cheese, or fresh dill. Serve with hot crusty bread. Makes 4-6 servings. menu cover aboard the S.S. Lurline, operated by Matson Lines in 1955. Click on image to enlarge. This print is available for sale, click here. Ancient Hawaiians numbered between 200,000 to as high as a million by the date of the European "discovery" of the "Sandwich Isles", as Hawaii was called then, by Captain James Cook on January 18, 1778. 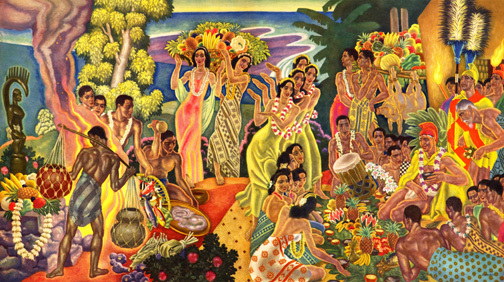 The Hawaiians during this time did not celebrate Christmas, but considered the four winter months, October through February, a time to celebrate the harvest and Lono, the Hawaiian god associated with rain and fertility. They called this period the "Makahiki" season. During these months, war was forbidden. Games were played. Special days were set aside to do chores, but the time of the Makahiki was for dancing, playing, and giving thanks. The highest chief of the island acted as host to Lono during Makahiki, performing ceremonies to mark the beginning and end of the festival. The chief collected gifts and offerings – food, animals, kapa, cordage, feathers and other items – on behalf of Lono and redistributed them later amongst lesser chiefs and their followers. Thus it might be thought of as the equivalent of modern Thanksgiving and Christmas traditions. In 1786 two English merchant ships sailed into Waimea Bay, off of the Hawaiian island of Kaua'i, the day before Christmas, carrying 33 crew members each. The ships were the Queen Charlotte, commanded by Captain George Dixon, and the King George, commanded by Captain Nathaniel Portlock. Captain Dixon had served under Captain James Cook during Cook’s third Pacific voyage, so he was familiar with the Hawaiian Islands. Once they had anchored, Captain Portlock went ashore to visit the islands people, giving out trinkets to the women and children he met. The next day, Christmas day to the English, Kaua'i Chief Kiana approached the ships in a long double canoe bearing gifts of welcome. 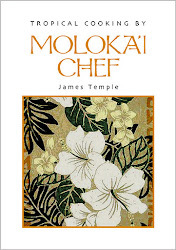 He brought the makings of a Christmas feast with him, hogs and fresh vegetables, coconuts and bananas. Captain Dixon was so pleased, he ordered the galley crew to prepare a Christmas dinner. A Christmas grog was made of rum mixed with coconut water. The island hogs were baked into a sea-pie, a concoction of available meats layered with hardtack and lard and baked in a large iron pot. The sailors probably celebrated by singing traditional carols of the British Isles. This was the first celebration of Christmas in the Hawaiian islands. It wasn't until 1862 that Christmas would become an official holiday in Hawaii. Today, Christmas celebrations in Hawaii include the food, customs, and traditions of all the people who have settled here from around the world. Is The Hawaiian Christmas Berry Toxic? 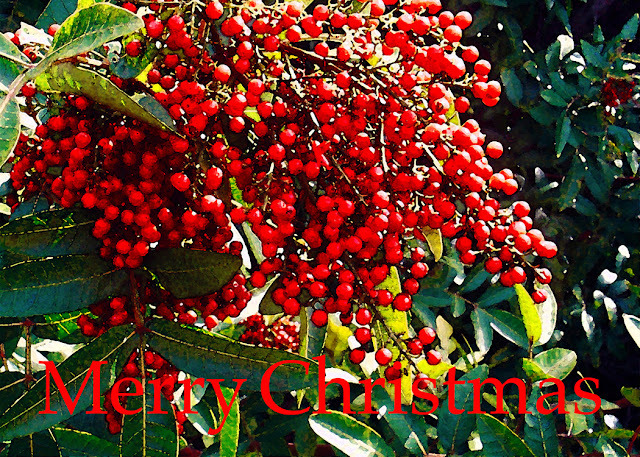 The "wilelaiki" blossom, which means "Christmasberry" in Hawaiian, was introduced to Hawaii from Brazil in 1911, according to a Bishop Museum website. The beautiful red berries from this invasive plant are pictured above, but looks may be deceiving. I was once told by a neighbor that the Brazilian pepper berry, when dried, is actually the same thing as the edible pink peppercorn, which is a culinary spice. After a little research, I found out that this may not be the case at all. According to this website, http://homecooking.about.com/od/spices/a/peppervarieties.htm, edible pink peppercorns come from the baies rose plant (Euonymus phellomanus), imported from Madagascar and are sold online by stores such as Williams-Sonoma. They said that the pink peppercorn from Madagascar is NOT to be confused with the pink peppercorn from the invasive Brazilian pepper berry (Schinus terebinthifolius) which grows in Hawaii. They also said that this berry causes allergic reactions in some people, particularly children, and can be toxic if eaten in large quantities, and are NOT recommended for consumption. Then I found a website that sells spices including edible pink peppercorns. They said that the Brazilian pepper plant is a closely related species to the Madagascar plant, and that these berries are also sold as pink peppercorns in some areas. As you can see, their is some confusion here. The USDA listed the Brazilian pepper tree as a "Noxious Weed" on their website, and the University of Hawaii Botany Department website lists it as an "alien plant". Another site warns that like poison ivy (Toxicodendron radicans), Brazilian pepper berries are a member of the Anacardiaceae family, a family of plants that includes poison ivy and poison oak. Contact with most parts of Brazilian pepper plant can cause an itchy skin rash and sometimes inflammation and swelling of the face and eyes. The flowers and fruits can cause respiratory irritation. Just trimming Brazilian pepper berry plant, especially when in bloom, can cause these allergic reactions in many people. Ingestion of the berries causes vomiting. The Brazilian pepper berry is also known as Florida holly, and is considered highly invasive in Florida and Hawaii. I also read, on this site, that the Brazilian pepper berry is toxic to cats, dogs, and horses, but not to birds, who love to eat the red berries and spread the seeds wherever they go. But that's not all... the plot thickens! I then found that a Honolulu candy company, Madre Chocolate, is not only selling bags of the dried Brazilian pepper berries for consumption, but also sells chocolate bars filled with these berries mixed with smoked sea salt. This company even asks its patrons to "Eat the Enemy and help eat these invasive plants out of existence in a delicious way". One chocoholic fan of this chocolate product is sold on it, and shows photos of all of the Brazilian pepper berries in this chocolate bar on his website. I'm confused about the Brazilian pepper berry, is it toxic or not? If it is, then shouldn't the Food and Drug Administration make sure that these Brazilian pepper berries don't end up in our food, or at least make sure that the packaging posts a warning? People are cooking with these berries, making tea out of it, the bees are making honey out of the flowers on the Big Island, and now a company is putting them in chocolate bars. I guess the old saying "when in doubt, do without" would be my advice until someone figures this out. Wraps are easy to make, and they are good for you. The best wraps are lettuce wraps, leaves of lettuce filled with whatever you like to eat, there are so many variations, limited only by your imagination and taste preferences. Lettuce wraps are also a great way to use leftovers from a previous meal but in a totally different way. Try making lettuce wraps the next time you have a party by putting out the components so everybody can put together their own. Pick a theme, like Mexican, Greek, or Asian, then decide what will work inside the wrap that goes with the theme. I have found that for best results, pick the largest, most pliable lettuces leaves. Boston, romaine, iceberg, red leaf lettuce, radicchio, napa cabbage, or large spinach leaves are possibilities. Core the lettuce and soak in ice water for an hour or two for easy removal of intact leaves. Separate the leaves and drain each one individually, then refrigerate on a towel for a couple of hours to crisp them. Lettuce leaves or cups can also be rinsed, dried and stacked, wrapped in a plastic bag and refrigerated several hours or overnight. Be sure to dry the lettuce well before serving. You can also use spices, sauces, yogurt, sour cream, and salad dressings inside the wrap to give it more flavor. Kids like wraps also because they can make it themselves and put what they like in them. So the next time you want something different to eat, "wrap it up"... with lettuce. Cut tuna into 1/2 inch chunks. Toast sesame seeds. Toss tuna with sesame seeds, sesame oil, ginger, scallions and soy sauce. Serve in lettuce leaves with steamed white rice. Makes 8 servings. In a large bowl, combine the first 12 ingredients. Refrigerate until serving. Just before serving, stir in avocado. Place 1/2 cup chicken mixture on each lettuce leaf; top each with 2 teaspoons sour cream. Fold lettuce over filling. Makes 6 servings. Combine all ingredients except lettuce leaves. Toss until blended. Chill until serving time. 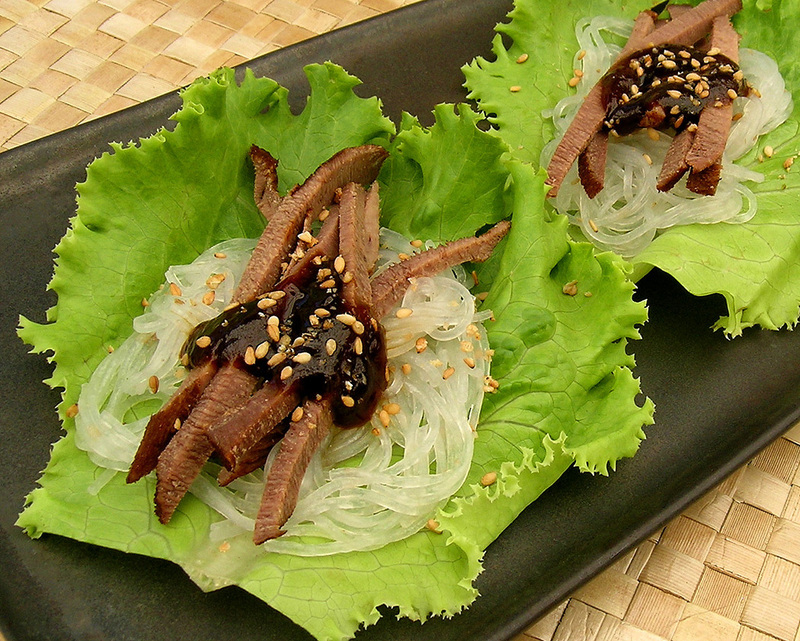 To serve, place some of filling mixture on lettuce leaf, wrap up and eat out of hand. Makes 6 servings. Reserve 8 cabbage leaves. Shred remaining cabbage to measure 2 cups. Combine soy sauce and next 3 ingredients (through cornstarch). Cut pork crosswise into 1/4-inch-thick slices. Stack several slices vertically; slice pork into 1/4-inch-thick pieces. Repeat procedure with remaining pork. Add pork, carrots, and mushrooms to soy sauce mixture; toss. Heat a large skillet over medium-high heat. Add 1 tablespoon oil. Add 1/4 cup onions; sauté 30 seconds. Add shredded cabbage and water; sauté 2 minutes. Remove cabbage mixture from pan. Add remaining 1 tablespoon oil. Add remaining 1/2 cup onions and garlic; sauté 30 seconds. Add pork mixture; sauté 3 minutes or until done. Add cabbage mixture; toss. Place about 1/3 cup pork mixture into each of 8 reserved cabbage leaves. Makes 4 servings, 2 wraps per serving. Cover bean threads with boiling water. Let stand for 5 minutes or until softened. Drain, and rinse under cool water. Chop noodles. While bean threads soak, combine cilantro, soy sauce, chile paste, and oil in a large bowl, stirring with a whisk. Add noodles and chicken to soy sauce mixture; toss well to coat. Spoon about 1/3 cup chicken mixture down center of each lettuce leaf; roll up. Makes 4 servings of 3 wraps each. Rinse whole lettuce leaves and pat dry, being careful not tear them. Set aside. In a medium skillet over high heat, brown the ground beef in 1 tablespoon of oil, stirring often and reducing the heat to medium, if necessary. Drain, and set aside to cool. Cook the onion in the same pan, stirring frequently. Add the garlic, soy sauce, hoisin sauce, ginger, vinegar, and chile pepper sauce to the onions, and stir. Stir in chopped water chestnuts, green onions, sesame oil, and cooked beef; continue cooking until the onions just begin to wilt, about 2 minutes. Arrange lettuce leaves around the outer edge of a large serving platter, and pile meat mixture in the center. To serve, allow each person to spoon a portion of the meat into a lettuce leaf. Wrap the lettuce around the meat like a burrito. Makes 4 servings. Heat 1 tablespoon of oil in a large nonstick skillet over medium-high heat. Add turkey, garlic and ginger to the pan and cook for about 6 minutes or until turkey is browned. Stir to crumble. Combine turkey mixture, onions and chopped water chestnuts in a large bowl, stirring well, and set aside. Meanwhile in a small bowl, whisk together hoisin, soy sauce, rice vinegar and roasted red chili paste and drizzle over the turkey mixture. Toss to coat completely. Add about 1/4 cup turkey mixture to each lettuce leaf. Makes 6 servings of 2 wraps each. This barbecued fish wrap recipe is great for a pupu or a light lunch around the grill. 4-6 fillets fresh 'white' fish, such as opakapaka (snapper), mahi-mahi, etc. Stir marinade ingredients together in a cup or small bowl. Rinse off the fillets and cut them into thirds or quarters (smaller sections, roughly 3 inches long, are good for this dish). Place these sections in a flat-bottomed bowl and pour marinade over fish, making sure all sides of the fish have marinade on them. Allow to marinate in the refrigerator while you make the dipping sauce and prepare the toppings. Stir all dipping sauce ingredients together in a sauce pan. Place pan over medium heat, stirring to dissolve the sugar. Taste-test, adding more chili if not spicy enough. If too spicy, add more coconut milk. If too salty, add more lime juice. When the sauce is hot, add the cornstarch-water mixture and stir. When sauce has thickened, remove from heat and set aside until you're ready to eat. This sauce can be served warm, or at room temperature. Prepare the toppings you have chosen. Place them in separate bowls on the table where you will be eating. For the lettuce wraps, carefully cut out the core of each head and discard. Now you should be able to carefully peel away the separate leaves. If lettuce is unwashed, carefully rinse under cool water. Pile the leaves back together and place on a plate on the table. Brush your grill with oil and heat up, then grill the fish until inner flesh is opaque and flakes easily. 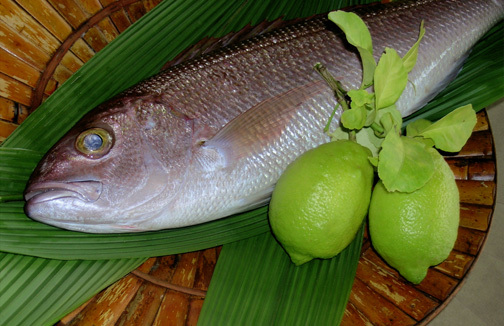 To serve, place the barbecued fish on a plate and place on the table. Now invite your guests to assemble their own wraps. Start with a leaf of lettuce. Add a small "bed" of bean sprouts, then place 1-2 pieces of fish on top. Add whatever toppings you'd like. Makes 4 servings. In a medium bowl, combine together tomatoes, tuna, green onions, basil, capers, vinegar, olive oil, garlic pepper and seasoned salt. Mix until blended. Gently fold in beans. Wrap up some of mixture in each lettuce leaf. Makes 6 servings. 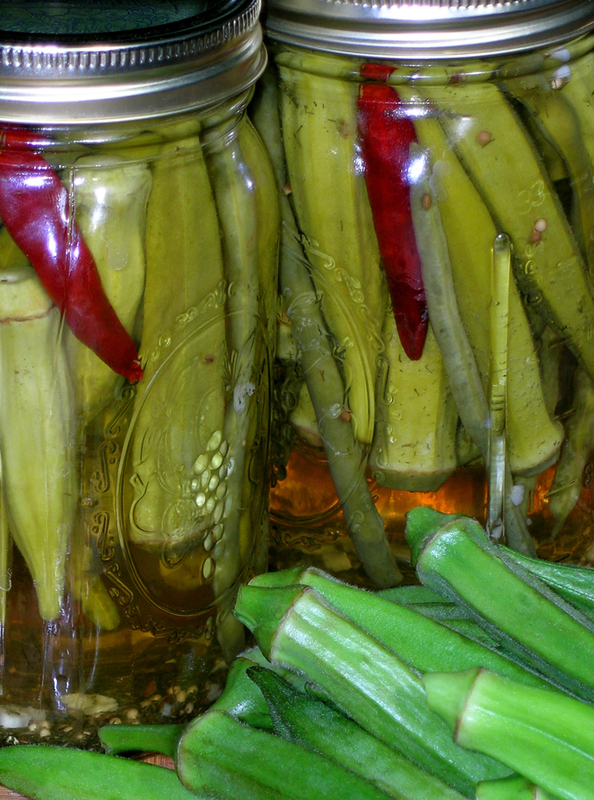 Most people seem to like pickled okra. When I have room in the pickling jar, I usually like to add a few green beans to keep the okra company. They are great in a bloody mary. Wash okra well, removing fuzz and stems. Leave the caps on; do not cut into the pods. In each of 4 pint jars, place 1 chile, 1/2 teaspoon mustard seeds, 3 sprigs of dill or 1 teaspoon dried, 1/4 of the minced garlic and 1/4 teaspoon peppercorns in the bottom of each of 4 sterilized pint canning jars. 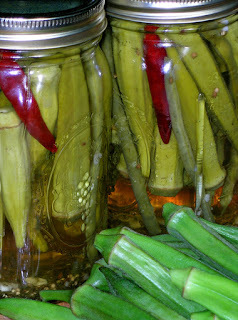 Divide the rinsed okra evenly among the 4 jars, standing them up vertically, alternating stems up and down. In a medium saucepan over medium heat, bring the salt, vinegar and water to a boil. Once boiling, pour this mixture over the okra in the jars, leaving 1/4 inch of space between the top of the liquid and the lid. Seal the lids. When the metal lid pops down, you know it's sealed properly. Set in a cool dry place for 2 weeks, and try not to eat them if you can until they are ready. Makes 4 pints. This is a chance for you to use the recipe above in this delicious salad. Bring 8 cups water to a boil in a 3-qt. saucepan; add pickling spice, and cook 5 minutes. Add shrimp; cover, remove from heat, and let stand 10 minutes or just until shrimp turn pink. Drain and cool 10 minutes. Meanwhile, combine pickled okra, diced pimiento, and next 6 ingredients. Add shrimp, and serve immediately with avocado slices, or cover and chill until ready to serve. Makes 6 servings. This is football food around my house. I grew up with this recipe and now I am passing it down to you. It's kind of a Southern thing, like hush puppies and black bottom pie. This is NOT a "slimy" recipe. In a large bowl beat egg with a fork, pour in milk, garlic powder and cayenne pepper and stir to combine. Pour the cornmeal in another big bowl. Pour enough oil in a big skillet, halfway up, or you can use a deep fryer. Set heat to Medium-high. Put some okra pieces in milk mixture and then coat in cornmeal batter. Fry in skillet 10-15 min, occasionally turning/stirring them around. They are done when crispy and golden brown but not black! Drain on paper towel lined plate. Sprinkle with salt and pepper. Repeat with rest of okra till all gone. Go Niners! Makes 6-8 servings. I am a big fan of tempura, but using okra along with other fresh vegetables like onion rings, string beans, red bell pepper and of course shrimp... it's a winner! Whisk tempura ingredients together and let chill. 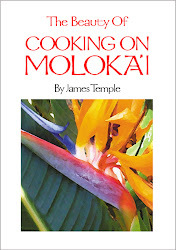 Heat canola oil in wok, deep-fryer or a large Dutch oven to 375˚F. In a shallow pie plate, add flour and 1 tablespoon Cajun seasoning and mix well. Season okra with 2 tablespoons Cajun seasoning. Dip okra in seasoned flour and then in tempura batter and place in oil, 1 at a time and fry until golden, about 4 minutes. Remove to a paper towel lined sheet tray. Season with salt. Serve with Buttermilk Dipping Sauce. Makes 6-8 servings. To make the dressing, in a medium bowl, whisk together the buttermilk, sour cream, lime juice, and hot pepper sauce, if desired. Add the green onions, parsley, and garlic. Adjust the seasoning, to taste, with salt and pepper. Makes about 1 1/2 cups. Grilling okra lets you enjoy the texture and flavor without the sliminess. The Japanese rub each pod of okra with salt, taking off the okra fuzz on the skin with their fingers. Drizzle the okra with sesame oil and soy sauce. Heat grill to medium-high heat and space okra apart on grill (you may need to skewer the okra to hold it in place). Turn after about 4-6 minutes and baste with a little more soy sauce. Grill another 4-6 min. Squeeze lemon juice on top; serve immediately. Sauté okra in hot oil in a large skillet over medium-high heat 5 to 6 minutes or until crisp-tender. Sprinkle with bread crumbs and seasoning, and cook, stirring often, 3 minutes. Sprinkle with Parmesan cheese, and serve immediately. Makes 4 servings. Stewed okra is great, but roasting keeps all of the flavor in, and the okra tends not to be slimy. Preheat oven to 425˚F. Arrange whole fresh okra in one layer, cut side up, on a foil lined cookie sheet. Drizzle with olive oil and sprinkle with salt and pepper. Bake in the preheated oven for 10 to 15 minutes. Makes 3 servings of 6 okra. Wash and dry the okra. Discard the top and bottom of the okra. Cut it lengthwise. Again split each half lengthwise, so you would have 4 finger like pieces. If the okra is big cut the pieces half midway (so 8 pieces from each okra) or use it as it is. Transfer the okra pieces to a bowl. Add oil so that the seasonings would stick to the okra. Then add all the other ingredients and mix it thoroughly with your hands. Make sure the plate in the microwave is clean and place the seasoned okra on it directly. Set the time for 5 minutes, then stir it and cooked it for another 2 minutes. Be careful while stirring because the plate will be hot. Microwave oven settings vary, so chose the time considering the type of oven you are using. From then on I increased the time by 30 seconds each time until I got the crispy texture. Don’t forget to stir after every 30 seconds. Do this 3 times, being careful not to burn the okra.Taste it after cooling for 1 minute. It should be crispy. Repeat the same for rest of the okra. Makes 2 servings. This traditional recipe for Okra (or Okro, as it is called in some parts of Nigeria) is one that can be created anywhere in the world, as it uses ingredients that can be found in most grocery stores. Gently saute sliced onions in oil. When translucent, after about 10 minutes, add tomatoes and garlic. Add the spices. saute gently for five minutes. Top and tail the okra and cut into pieces about 1/2 inch thick. Add to the spices and cook gently for 10-15 minutes. Makes 6 servings. This Portuguese okra recipe is delicious served with a spicy red wine and crusty bread. In a large bowl, marinate the pork chops in lemon juice with 2 tablespoons of olive oil. In a large sauté pan, heat 1 tablespoon of cooking oil over medium-high heat. Add the onion slices and cook until soft, around three minutes. Add the chopped tomatoes and continue cooking until the tomatoes have softened and broken down into a chunky sauce. Add the whole okra and the black olives and cook until the okra is tender, around 10 to 12 minutes. Season to taste with salt. Remove the pork chops from the marinade and pat dry with a paper towel. Dredge the pork chops in the cornmeal and then season with salt. In a large sauté pan, heat two tablespoons of cooking oil over medium-high heat. Add the pork chops to the pan and cook until browned on one side, then flip, lower the heat to medium, cover and continue to cook until the pork chops are done, around 2 to 3 minutes a side. Remove the pork chops from the pan and serve immediately with the okra and tomato sauce mix on the side. Makes 4 servings. A delicious side dish from India. Slice the okra diagonally into 1/2 inch slices. Heat the oil in a large, nonstick frying pan and when hot add the mustard seeds. As they begin to 'pop', add the dried red chillies and onion. Stir-fry and cook over a medium heat for 4-5 minutes until the onion has softened and then stir in the tomatoes, cucumber, garlic, ginger and turmeric. Stir-fry for another 3-4 minutes and then turn the heat to high and add the sliced okra. Stir-fry for 2-3 minutes, season and remove from the heat. Sprinkle with grated coconut and serve immediately. Makes 4 servings. A south-indian crispy okra dish. Okra is known as Bhinda in Gujarati. Heat about 2 tablespoons oil in a frying pan. When well heated, add the sliced okra. Stir-fry, without mashing the okra, on medium heat for 2-3 minutes. Then, put a lid on the frying pan and allow to fry till golden brown and no longer slimy, stirring occasionally. This should take around 15 – 20 minutes. Take care not to burn the okra. When cooked, remove the okra to a paper towel to drain. Heat about 1 tablespoon oil in the same pan and fry the potatoes in it, till they are golden brown. Remove and place on paper towel to drain. Now heat about 1/2 tablespoon of oil, and when heated, add the cumin seeds. When the cumin seeds begin to crackle, add the onions and let them soften on low-to medium heat. When the onions are translucent, add the dry spices. Mix well and add in tomato paste and chopped tomatoes, the fried okra & potatoes. Mix well and add salt to taste. Finally, garnish with a handful of chopped coriander or cilantro leaves. Add lemon juice if desired. Makes 2 servings. "Feast of the Seven Fishes"
A dinner, in many ways, is much more than just a meal, it's a collaboration of food, loved ones, and tradition. A few years ago my wife and I invited a few friends (10) over for dinner on Christmas Eve. The house was all decorated and ready when the guests arrived, and naturally I was in the kitchen preparing the meal. The theme of the party was "The Feast of the Seven Fishes", which is a traditional Italian Christmas Eve celebration, consisting of seven, or more, different seafood dishes. You can use any fish recipe you like. Anyway, everyone sat down around the table as I brought out the courses one-by-one. Needless to say, everyone had plenty to eat, and the party was a success thanks to good friends and food. Naturally, all of this, from beginning to end, was accompanied by good table wines and friends with large appetites. Wash cauliflower, cut into small flowerets, and slice the remainder. Peel the carrots and cut into 1 1/2-inch logs or diagonal slices. Wash and string the celery and slice diagonally. Wash, trim, and cut the peppers into strips. Wash, trim stem end and remove strings from green beans. In a saucepan, bring to a boil 1 cup water, the vinegar, oils, sugar, salt, oregano, and pepper to taste. Add the vegetables and olives. Cover the pan and cook for 3-4 minutes. Uncover, cool and refrigerate for 24 hours. Drain before serving. Garnish with fresh parsley and capers. Marinated artichoke hearts may be added to serving platter. Makes 15 servings. Combine first 3 ingredients and 2 Tbs. oil in a bowl. Heat remaining oil in a heavy nonstick skillet over medium high heat. Cook cauliflower 10 minutes, covered, stirring occasionally. Uncover skillet and sauté cauliflower another 5-10 minutes, until tender and browned. Transfer cauliflower to a bowl and toss with olive mixture and parsley. Season with salt and pepper to taste. Makes approximately 4 cups. Combine olive oil and remaining ingredients in a large zip lock freezer bag; shake well; add shrimp, stirring gently; cover and marinate in refrigerator for at least 8 hours, stirring occasionally; remove shrimp from marinade, using a slotted spoon; reserve marinade; place shrimp on water soaked skewers; grill over medium hot coals 3 to 4 minutes on each side, basting frequently with marinade. DO NOT OVER COOK. Makes 8 servings. Boil the cleaned cuttlefish in a pan of water with the vinegar for 30 minutes. Meanwhile prepare the remainder of the ingredients. Once the cuttlefish are cooked, remove them from the water and let them cool on a plate for 15 minutes. After they've cooled cut them into thin slices and put them in a bowl. Using a fork beat the oil with lemon juice, salt and pepper. Add the oil mixture to the cuttlefish along with garlic and parsley and then combine well. Serve immediately or refrigerate and serve later. Notes: This dish makes a good appetizer, you can serve in small plates on top a lettuce leaf. Makes 6-8 servings. Remove skin from filets & cut into 1 inch cubes. In a 5 quart pan, cook onions, celery, bell pepper & garlic in oil over medium heat until tender but not brown. Add tomatoes, broth, wine, parsley, salt, sugar & basil. Simmer for 10 minutes. Add fish & cook over low heat for 10 minutes or until fish flakes easily when tested with a fork. Stir occasionally. *Note: This recipe is for basic fish soup, however shellfish can be added for variety like crab, shrimp, clams, mussels, scallops, etc. Makes 6 servings. Slice French bread, coat with mayonnaise, sprikle with garlic powder, Italian seasoning and or parsley and Parmesan cheese. Bake in a 300˚F oven for about 20 minutes, then lightly brown under broiler. 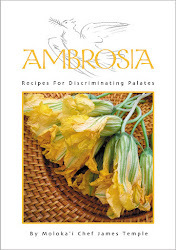 *You may substitute a mixture of 1/2 cup pureed pitted Kalamata olive and 1 tablespoon olive oil for the olive paste. Preheat oven to 400˚F. Grease a large baking or cookie sheet. In a medium bowl, combine feta cheese, parsley, olive paste, and egg whites. Unfold one of the pastry sheets on a lightly floured surface, keeping the remaining pastry sheets in the refrigerator. Roll into a 14x16-inch rectangle with a floured rolling pin. Cut crosswise into halves. Spread half the olive mixture over one pastry half. Top with the remaining pastry half. Roll gently with a rolling pin to seal the layers together. Cut the pastry crosswise into 1/2-inch wide strips. Arrange the strips 1-inch apart on prepared baking sheet, twisting each strip 3 or 4 times. Bake approximately 12 to 15 minutes or until puffed and light brown. Remove from oven and let cool on a wire rack. Repeat the process with the remaining puff pastry and remaining olive mixture. Serve at room temperature. Store in a tightly covered container. Makes approximately 56 bread sticks. Preheat oven to 375˚F. In a small bowl, combine the cream cheese, lightly beaten egg, Parmesan, and salt. Stir to combine. Spoon mixture into a plastic zip-top bag. Set aside. To use as a pastry bag, cut corner off bag to make a 1/4-inch diameter opening. Lay out thawed phyllo dough. Working quickly to keep dough from drying out: brush top sheet with melted butter, pipe cheese filling along long edge of phyllo 1/2-inch from each end. Fold over ends to seal in filling and roll up straw. Repeat with remaining sheets of phyllo and place on a baking sheet. Bake until golden, about 10 minutes. Serve warm with pesto for dipping. Makes 36 straws. Bring a large pan of water to a boil. While you are waiting for the water to boil melt the butter in a medium saucepan over medium heat. Slowly cook and stir mushrooms in the butter until tender. Mix in shrimp. Cook until pink, about 2 more minutes. Remove mushrooms and shrimp from saucepan and set aside. Reduce heat to low. Place flour in pan. Cook and stir approximately 2 minutes, then stir in chicken broth, heavy cream and pepper. Simmer 5 to 10 minutes, or until thickened. Stir mushrooms, peas, shrimp and Parmesan cheese into the sauce mixture. Continue cooking 2-3 minutes. Add approximately 1 tablespoon of salt and the pasta to the boiling water. Cook for about 8 -10 minutes. Drain the pasta when it is al dente. Add it to the pan with the sauce. Stir over medium heat for 1-2 minutes, coating the pasta with the sauce. Sprinkle with fresh chopped herbs and more cheese and serve at once. Makes 4 servings. Thaw snapper, if frozen. Rinse and pat dry. Spray a 10x6x2" baking dish with cooking spray; set aside. 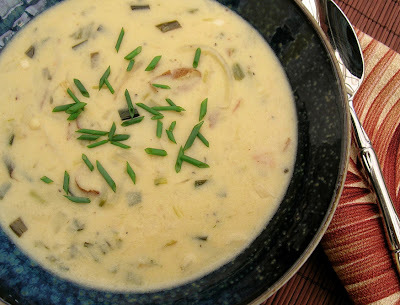 In a small bowl stir together mayonnaise, Parmesan cheese, chives or green onion, and Worcestershire sauce. Spread mayonnaise mixture over fish fillets. Saute onion and add to baking dish with sliced tomatoes to cover bottom of dish. Season with salt and freshly ground black pepper. Add fish over top and sprinkle with Parmesan cheese. Bake, uncovered, in a 450˚F oven for 12-15 minutes or until fish flakes easily when tested with a fork. Serve over baked polenta (recipe follows). Garnish with freshly chopped basil or parsley. Makes 4 Servings. Stir a third of the butter into the cooked polenta. Sprinkle a work surface with a little water. Spread the polenta out onto the surface in a layer 1/2 inch thick. Allow to cool. Cut the polenta into 2 1/2 in rounds. Heat the oil in a medium saucepan with 1 tbsp of the remaining butter. Add the onions, and stir over low heat until soft. Season the onions with nutmeg, salt and pepper. Preheat the oven to 375 degrees. Butter an oven proof dish. Spread a few of the onions slices in the bottom of the dish. Cover with a layer of polenta rounds. Dot with butter. Add a layer of the sliced mozzarella or Cheddar, and a sprinkling of parsley and Parmesan or Romano. Season with salt and pepper. Make another layer of the onions, and continue the layers in order, ending with the cheese. Dot the top with butter. Bake for 20 - 25 minutes, or until the cheese has melted. Serve from the baking dish. Makes 4-6 servings. In food processor, mince whole garlic cloves; add anchovies. Finely chop. Add mustard, Worcestershire, lemon juice, vinegar, oil, pepper, grated Parmesan, blue cheese and egg; process until smooth and thick. This dressing will keep in refrigerator for days. In bowl, toss lettuce and dressing. Top with capers, roasted red pepper slices and remaining Parmesan cheese. Makes 10 servings. To make filling, toss all filling ingredients together in a 9-inch glass or ceramic pie plate and let stand until juicy, about 30 minutes. Preheat oven to 400°F. To make topping, sift together flour, baking powder and soda, salt, and 1 teaspoon sugar in a bowl. Blend in butter with your fingertips or a pastry blender until mixture resembles coarse meal. Stir in buttermilk with a fork just until combined (do not over mix). Drop rounded tablespoons of dough over filling, leaving spaces in between to allow topping to expand. Sprinkle with remaining 2 teaspoons sugar. Bake cobbler in middle of oven until fruit is tender and topping is golden, about 30 minutes. Cool slightly, about 15 minutes, and serve warm with honey ice cream (recipe follows). Note: Other fruit may be added to the cobbler like canned cherries. Makes 4 servings. In a large saucepan, add all ingredients. Stir to dissolve the honey. Heat over moderate heat, stirring from time to time, just until tiny bubbles form around the edges of the pan, 3 to 4 minutes to cook the egg yolks. Remove from the heat and let steep, covered, for 1 hour. Cover and refrigerate until thoroughly chilled. Stir the mixture again to blend. transfer it to an ice cream maker and freeze according to manufacturer's instructions, or about 1/2 hour. Remove from ice cream maker into plastic containers and freeze at least 3 hours. Refrigerate for 1/2 hour before serving to soften. Makes 6 servings. Preheat oven to 350˚F. Have ready in a bowl: 3 cups moist shredded coconut: 8 oz. Add: 1 teaspoon vanilla or almond extract and 1/8 teaspoon salt. Combine these ingredients with: 2/3 cup sweetened condensed milk to make a thick paste. These cookies are much improved by folding into batter: (1 to 2 stiffly beaten egg whites) Roll the paste into balls or drop it from a teaspoon onto well-greased cookie sheets, about 2 inches apart. Bake 10 to 15 minutes, until edges are lightly browned. They may be rolled in sifted confectioners sugar or dipped into or drizzled over with melted semi-sweet chocolate. Makes about 20 1-inch cookies.